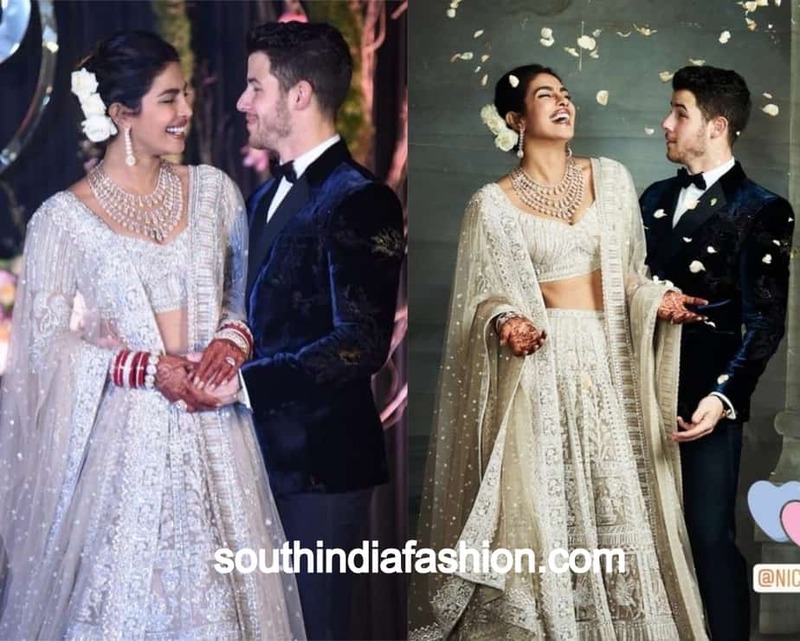 Best Celebrity Indian Brides Who Ended 2018 with a Bang! 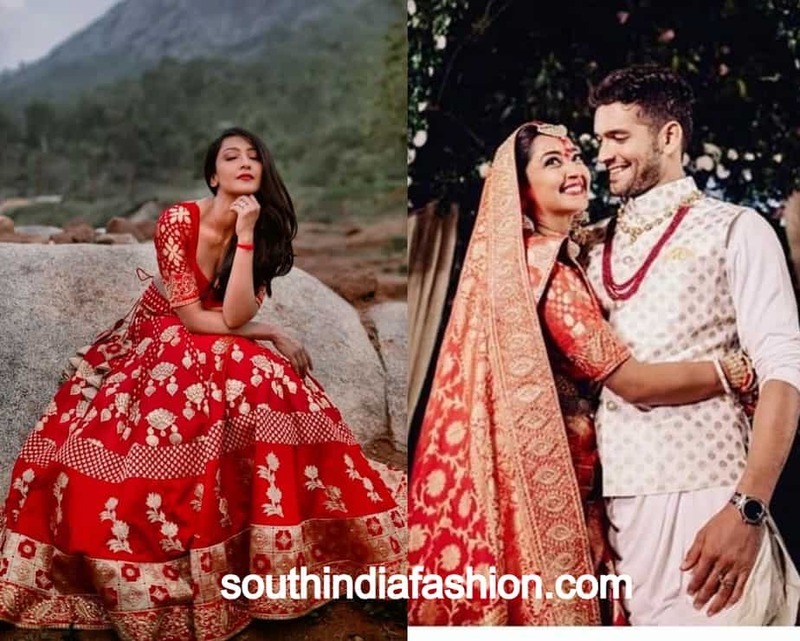 Celebrity Sarees Best Indian Celebrity Brides Who Ended 2018 With A Bang! 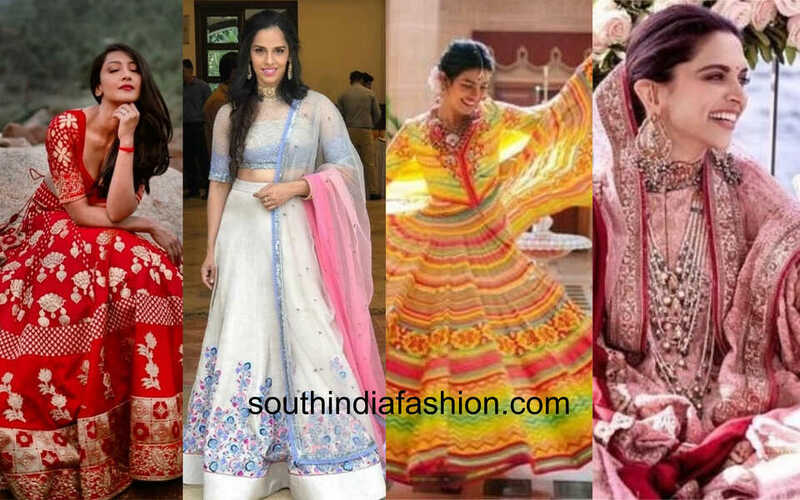 Best Indian Celebrity Brides Who Ended 2018 With A Bang! Probably no other year had seen as many celebrity weddings as 2018 did. Especially the end of the year brought in so many celebrity couples together. While we knew about some of these weddings, others were a huge surprise. Let us look back at a wonderful year and some amazing celebrity brides who looked absolutely stunning on their special day. The entire nation was awaiting this wedding. 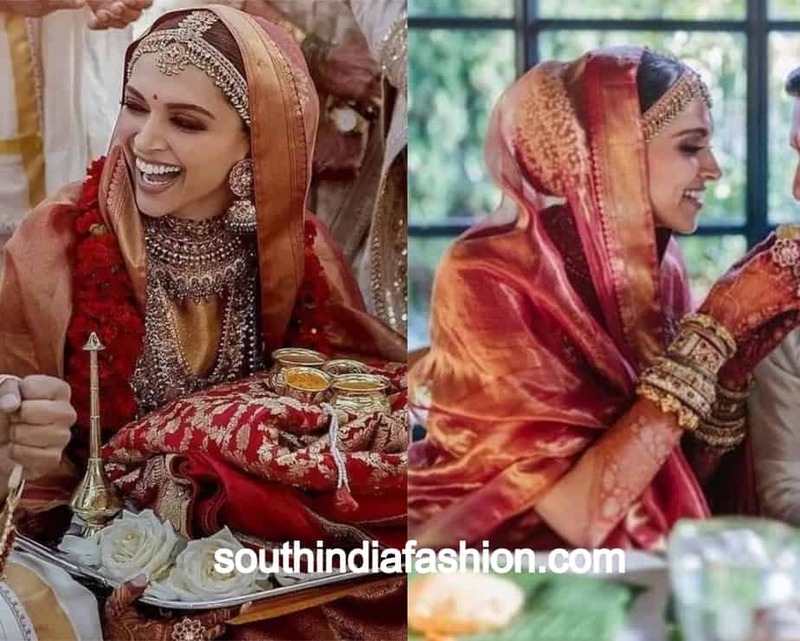 As the current Bollywood stars Ranvir Singh and Deepika Padukone tied the knot, many hearts broke and quite a few melted. The wedding ceremony officially began with a Nandi Puja at the bride’s paternal residence in Bangalore. Deepika wore a simple, yet classy orange colored salwar suit by Sabyasachi Mukherjee. She looked glowing and happy in minimal makeup and simple hairstyle. The only visible jewelry were a pair of chandbalis. For the mehendi that took place in Italy, Deepika wore a blush pink anarkali suit again by Sabyasachi Mukherjee. A magenta pink shawl added a pop of colour to the ensemble while it kept her warm in the Italy winter. A multilayered pearl haar and dazzling earrings were the accomplices for this look. 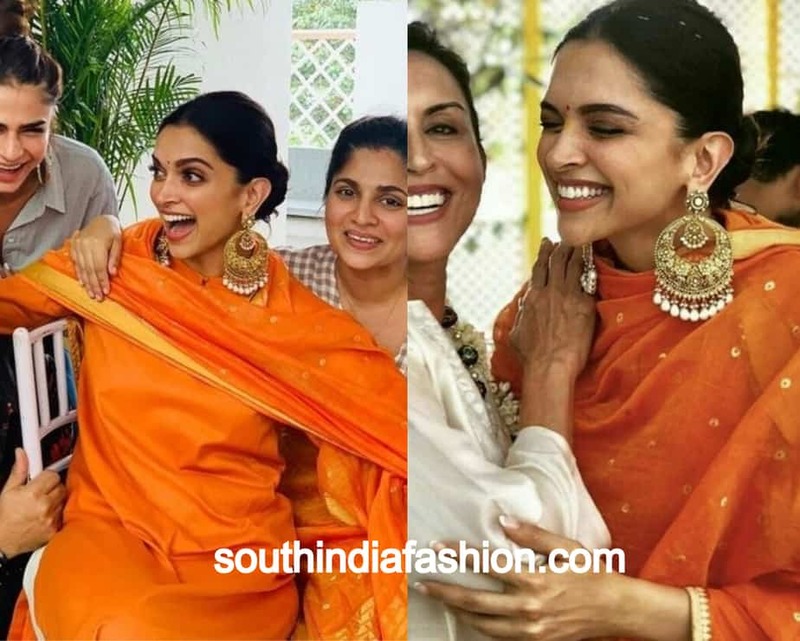 Deepika looked every bit of a south Indian bride on the day of her Konkani wedding. 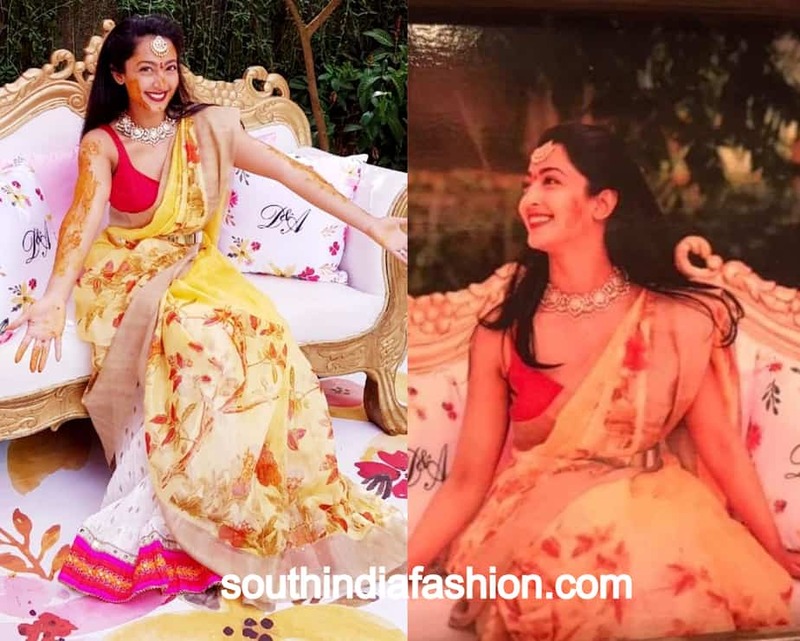 A grand red and golden silk saree from Angadi Galleria in Bangalore was a gift by her mother Ujjala Padukone. There were traditional accessories like a statement matha patti, choker, guttapusalu necklace and huge jhumkas. We just loved the subtle makeup look that the actress opted for. 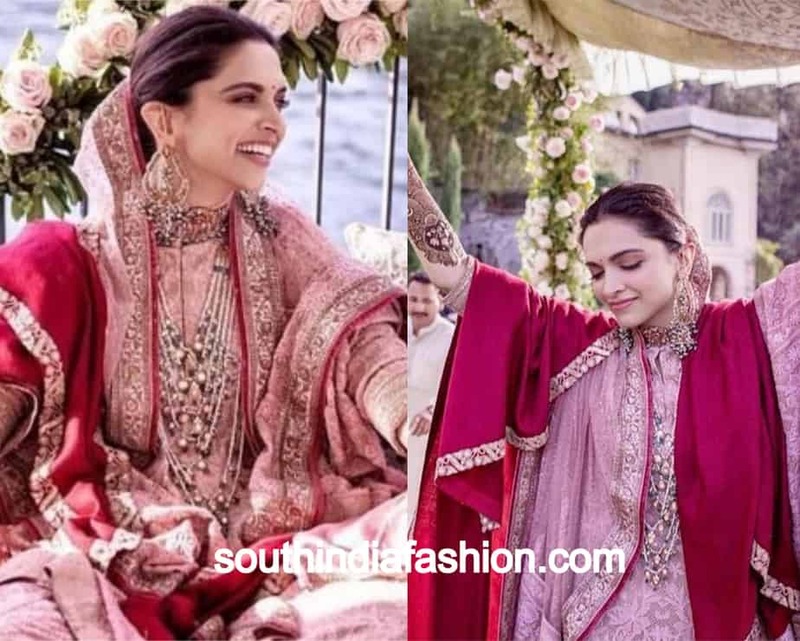 For the Sindhi wedding, Deepika wore a traditional red lehenga. It was a gota patti lehenga paired with lots of golden and kundan jewelry. 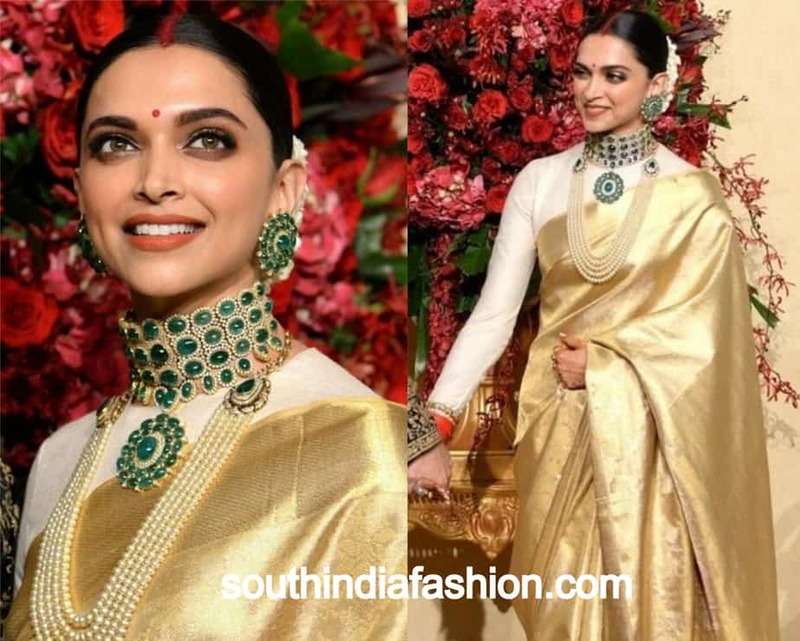 At the Bangalore reception Deepika was again seen in a cream and golden silk saree from Angadi Galleria which she paired with a full sleeved blouse. Overall, we have to say that Deepika was certainly a beautiful bride. 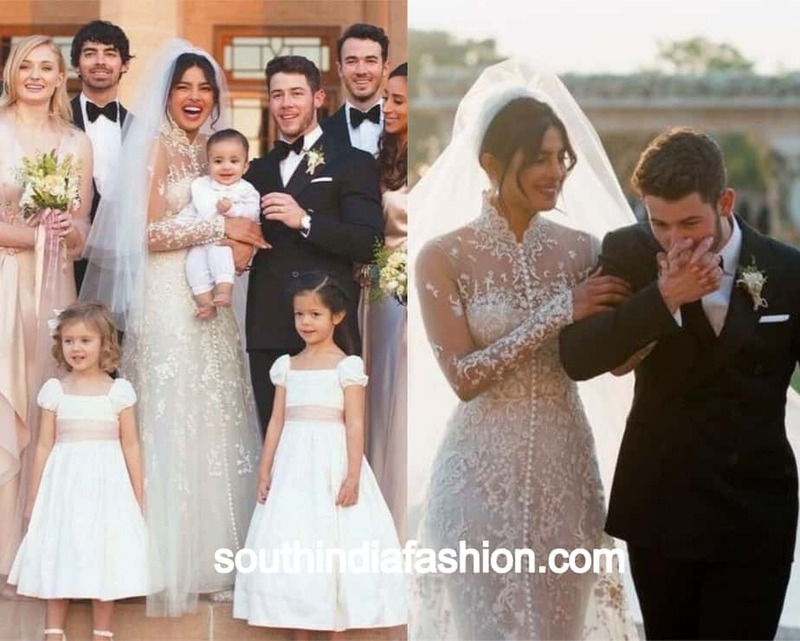 Our own desi girl finally got hitched to her American boyfriend Nick Jonas. The wedding kicked off with a lavish mehendi event in Rajasthan. 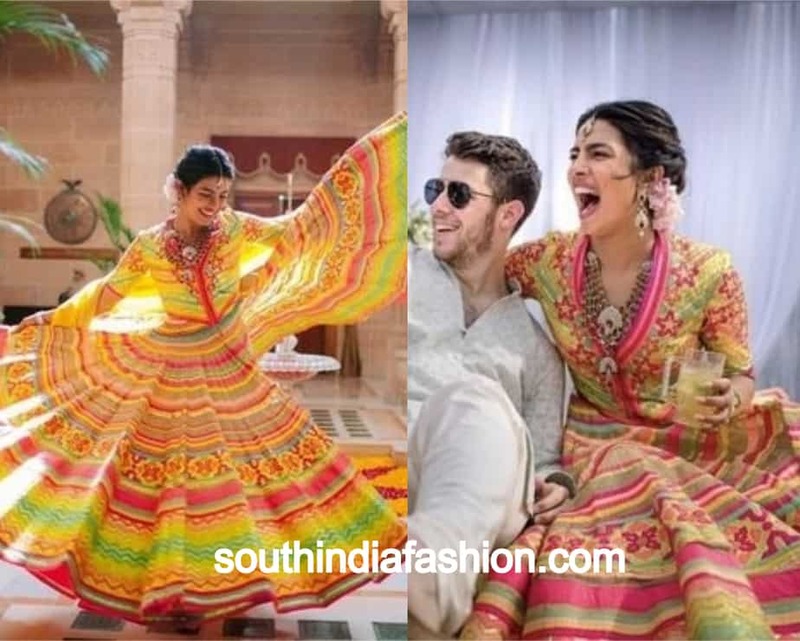 Priyanka chose to wear a colorful, traditional ensemble by Abu Jani Sandeep Khosla. She used heirloom jewelry along with the outfit and had an interesting braid and bun hairstyle on. 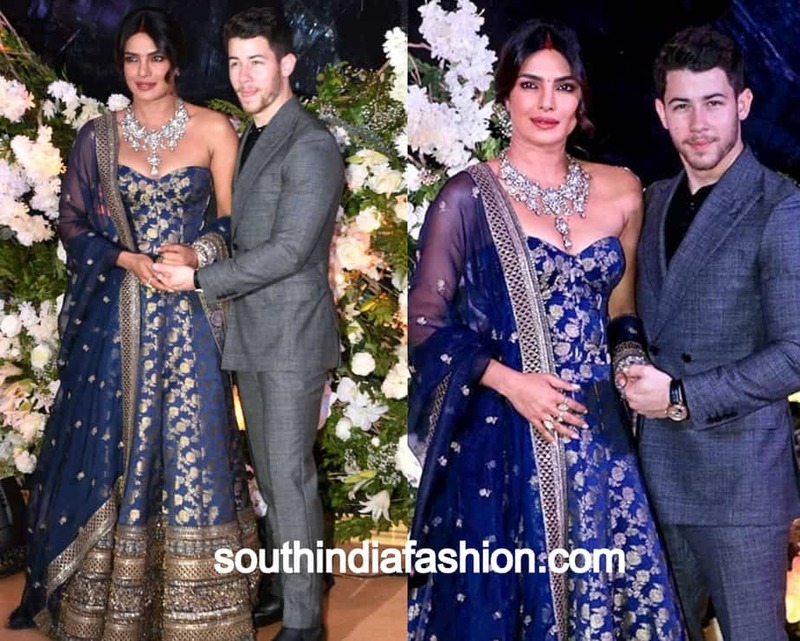 For the Sangeet ceremony, Priyanka wore a gold and silver sari with hand-embroidered sequins by Abu Jani Sandeep Khosla. It was a simple, yet classy look. For the Christian wedding, we saw PC in a breath taking custom Ralph Lauren wedding dress and a 75 feet long bridal veil. This look will surely go down in the history as one of the best bridal looks of celebrities. 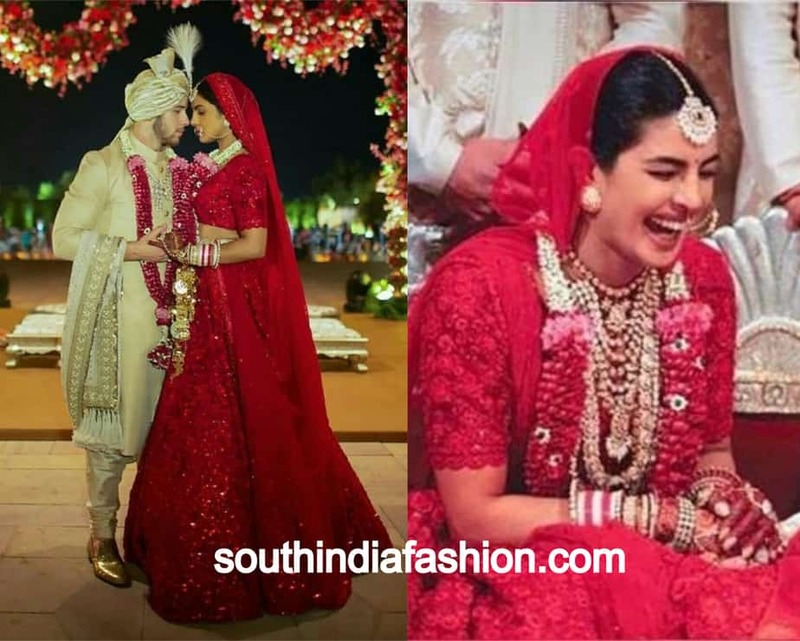 For the Indian wedding ceremony, Priyanka wore an effervescent red lehenga by Sabyasachi Mukherjee. Polki jewelry and festive Indian makeup completed this stunning bridal look. For the reception in New Delhi, Priyanka chose to wear a beaded lehenga by Falguni Shane Peacock. Diamond jewelry and hair bun with fresh white roses completed this chic look. At the Mumbai reception, the actress was seen in a royal blue corset Benarasi gown again by Sabyasachi Mukherjee. The accessories were also from Victorian jewels by Sabyasachi Jewelry. When an heiress of an empire gets hitched, we all do expect the ceremony to blow our minds. Isha Ambani’s wedding did exactly that. The wedding began with a Graha Shanti Puja, for which Isha wore a custom hand-painted, embroidered tilla work lehenga by Sabyasachi. The necklace and earrings with uncut diamonds and emeralds were also from Sabyasachi Heritage Jewelry. Simple makeup and blow dried hair completed this look. On the wedding day, Isha looked no less than a Goddess. The 16-panelled off white ghagra had a long trail. This Abu Jani Sandeep Khosla outfit had hand embroidered panels and crystal and sequin encrusted flowers. It was pleasant to see a special drape that the bride chose was her mom’s 35-year-old bandhani wedding sari. 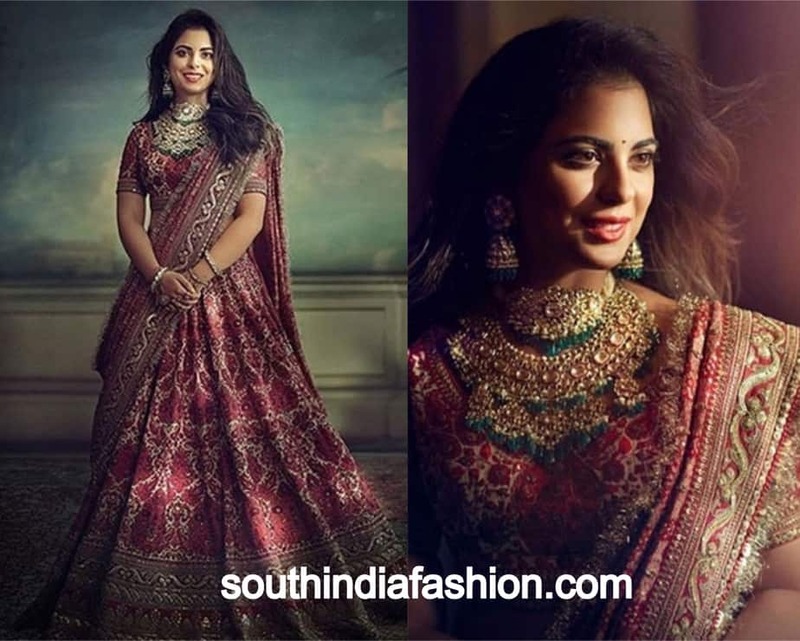 For the wedding reception, Isha wore a golden lehenga by the international designer, Valentino. She accessorized this classy look with diamond jewels. For the second wedding reception, Isha chose a maroon velvet lehenga by Sabyasachi. Diamond jewellery and neutral makeup complemented her look. 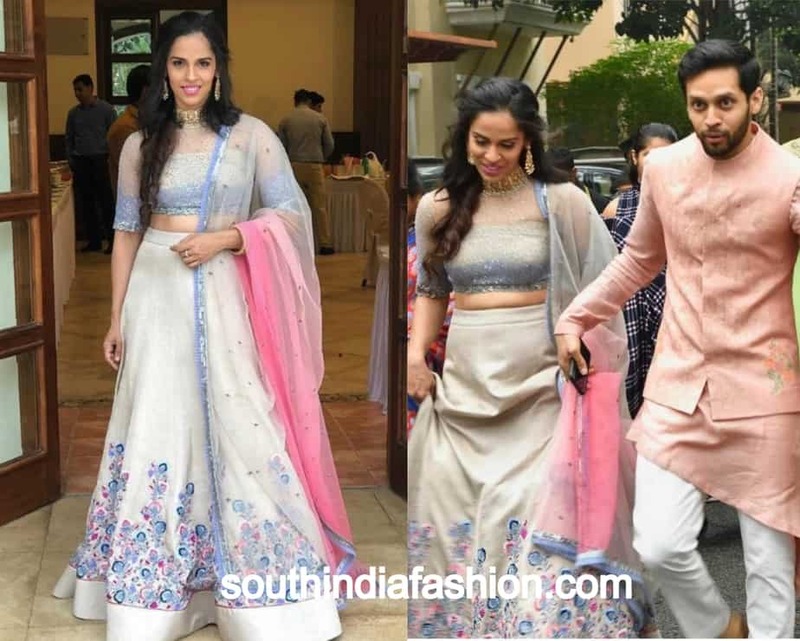 It was a simple wedding for the badminton ace Saina as she wedded her childhood sweet heart. The sports star looked stunning in an embroidered blue floral lehenga by Vaishali Agarwal. Lose curls and minimal makeup made this blushing bride look absolutely splendid. 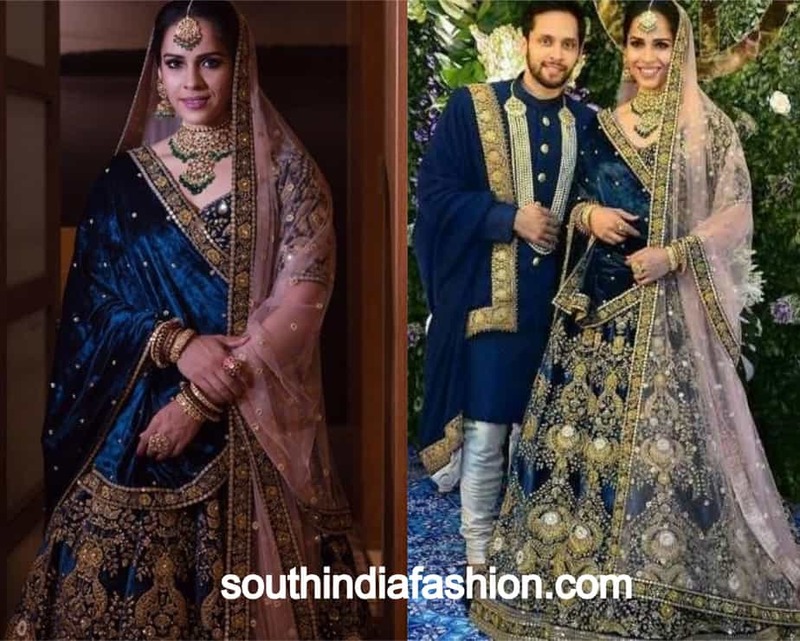 For the reception Saina wore an indigo colored velvet lehenga which had heavy embroidery along with crystals, zardosi and pearls. 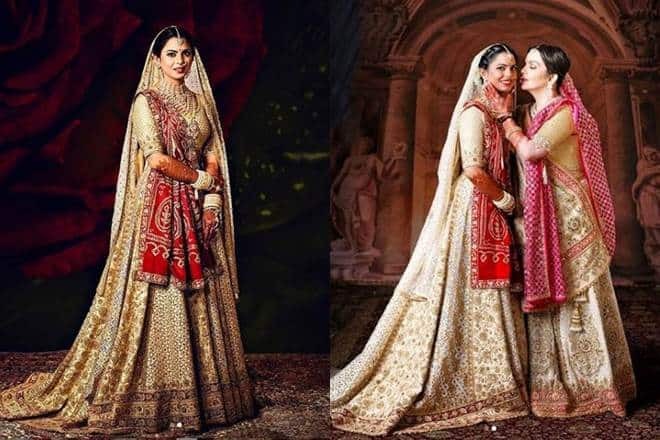 It was designed by Sabyasachi. Statement neck piece and earrings with uncut diamonds, Burmese rubies, and emeralds completed the royal look. 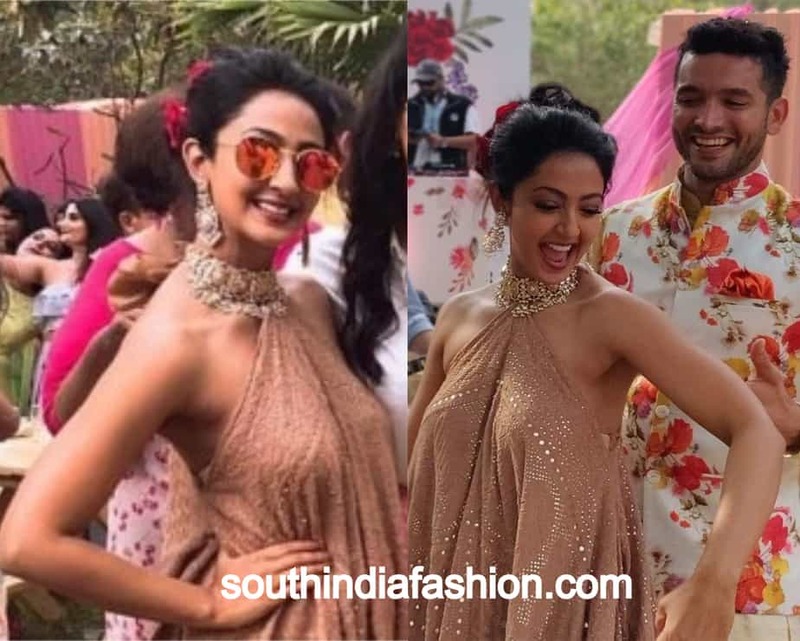 The Kannada actress married long-time boyfriend and co-actor Diganth in Bangalore last month. She looked like a goddess in her red and gold lehenga. For the haldi the actress chose to wear a yellow floral lehenga with a sleeveless pink blouse. The sangeet look was lit as Andy wore a halter neck beige colored outfit. Large choker and earrings completed this Indo- western look. These are some of the celebrity brides who mesmerized us in 2018. 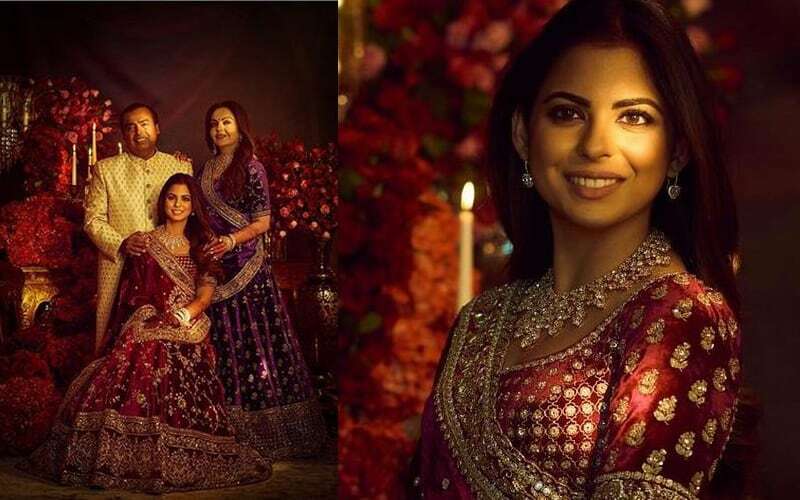 Isha Ambani in a pink Sabyasachi lehenga at her brother’s wedding!